Authors: Lo, S.-Z. A.; Murphy, T. E.
Abstract: We describe the fabrication, simulation, and measurement of a terahertz (THz) filter composed of nanoporous silicon multilayers. 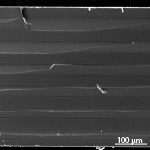 Using electrochemical etching, we fabricated a structure composed of alternating high- and low-index layers that achieves 93% power reflectivity at the target wavelength of 1.17 THz, with a stopband of 0.26 THz. The measured reflection and transmission spectra of the multilayer filter show excellent agreement with calculations based on the refractive indices determined separately from single-layer measurements. This technique could provide a convenient, flexible, and economical way to produce THz filters, which are essential in a variety of future applications.